We provide high quality dog foods both in dry and wet form from popular brands. We import Dr. Clauder’s dog food which is a high quality Europe brand and supply it as wholesaler in Afghanistan. We also distribute and supply Farmina, Italian brand, Reflex which is a famous Turkish brand. 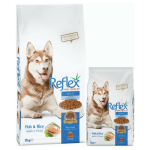 Reflex Fish and Rice Adult Dog: Reflex Fish and Rice Adult Dog, an especially formulated completeand balanced premium dog food including fish protein to meet the nutritional requirements of adult dog breeds. 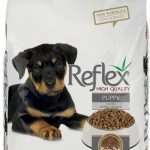 Reflex Lamb and Rice Puppy: Reflex Lamb and Rice Puppy, an especially formulated complete and balanced premium dog food including lamb protein to meet the nutritional requirements of puppies for optimum growth. 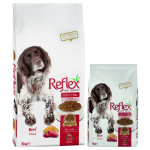 Reflex High Energy Adult Dog: Reflex High Energy Adult Dog, an especially formulated complete and balanced premium dog food including beef meat protein to meet the nutritional requirements of adult dog breeds that demand higher energy. Dr.Clauder’s Junior Large Breed is perfect for dogs of large and very large breeds (final weight of over 25 kg) from the 8th week. It optimally supplies your dog with: – Highly available calcium and phosphorus for a strong bone structure. – Mussel concentrate, gelatine hydrolyzate and glucosamine to support the joints and promote cartilage formation. – prebiotic fibre (FOS), which ensure optimal digestibility. Contains a complex of mannan-oligosaccharides (MOS), fructooligosaccharides (FOS) and yeast beta-glucans. May have a positive effect on the young dog´s sensitive intestinal microflora. The immune system can thus be strengthened, which allows your dog to grow up healthy. 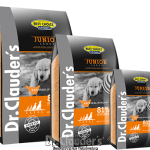 Dr.Clauder’s Junior Large Breed is free of preservatives. Dr.Clauder’s Senior / Light is perfect for all dogs whose energy requirements are lower. These include older dogs because their metabolism is slower and dogs with excess weight, because these need a reduced energy supply for optimal weight management. Dr.Clauder’s Senior / Light provides: – with the reduced energy content, that the dog does not convert any surplus energy into fat. – for optimum digestibility, through prebiotic fibre (FOS) – for the support of the immune system with yeast-beta glucans. Dr.Clauder’s Senior / Light is particularly tasty and delicious and is very well received by dogs. Due to the appropriately tuned recipe and the high proportion of crude fibres, your dog stays satisfied and contented for longer. Dr.Clauder’s Best Choice Adult Medium is perfect for adult dogs of small and medium sized breeds (final weight 5 – 25 kg). 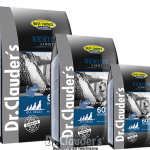 Dr.Clauder’s Best Choice Adult Medium is optimally digestible with prebiotic fibre (FOS). It provides your dog with the best: – high quality protein from poultry and omega fatty acids for a shiny coat. – yeast betaglucans, which support the natural immune system. With a complex of ginseng and spirulina. Ginseng root and spirulina algae can strengthen the defenses and support well-being. 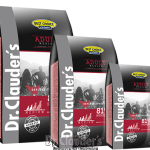 Dr.Clauder’s Adult Medium is free of preservatives.